…my waters broke. Tomorrow is my little boy’s birthday. How my world has changed. So, it took me a few days to get the rest of these pictures up. 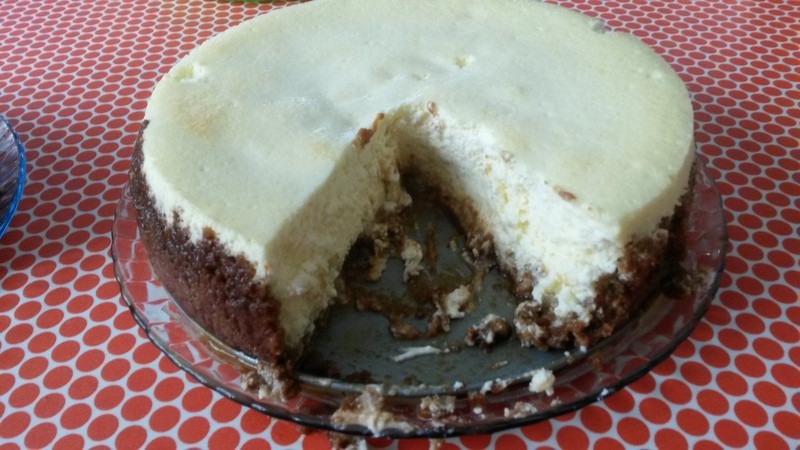 Friday was spent all day with the kids and once the kids were in bed, I baked a Muzzy’s Cheesecake and cleaned. Then all of Saturday was spent cleaning more and having a party. Here are the finished cakes! 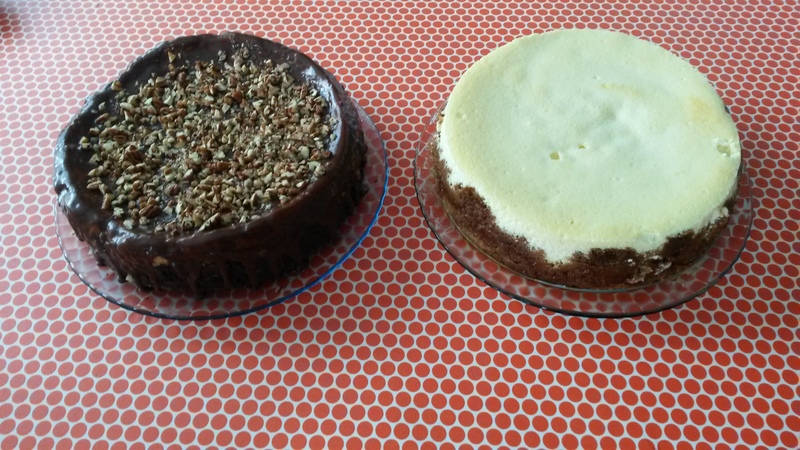 Chewie Gooey Brownie Cake on the left and Muzzy’s Cheesecake on the right. 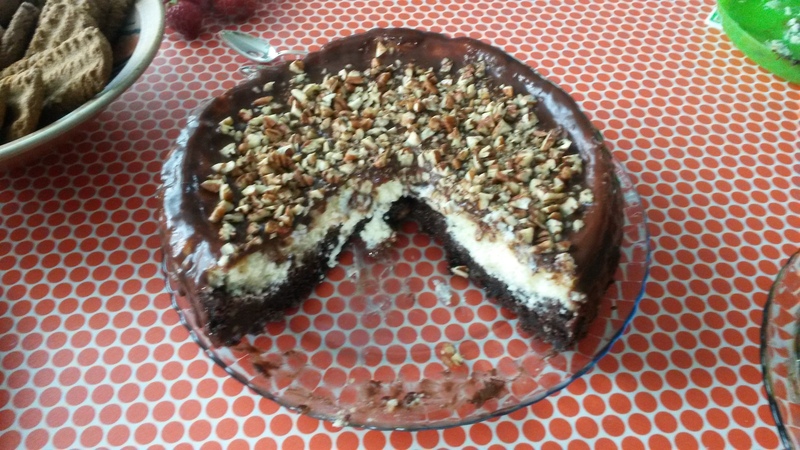 I’m going to get the cheesecake recipe typed up as soon as I can and posted here. I’ve promised it to a couple of friends. When I was young, my dad made me this redwood desk. I used it a lot, the scratches on the surface prove that. And now my dad has mailed it to me for my birthday!!! I was totally shocked when I opened the package they sent and saw this. I love my dad. 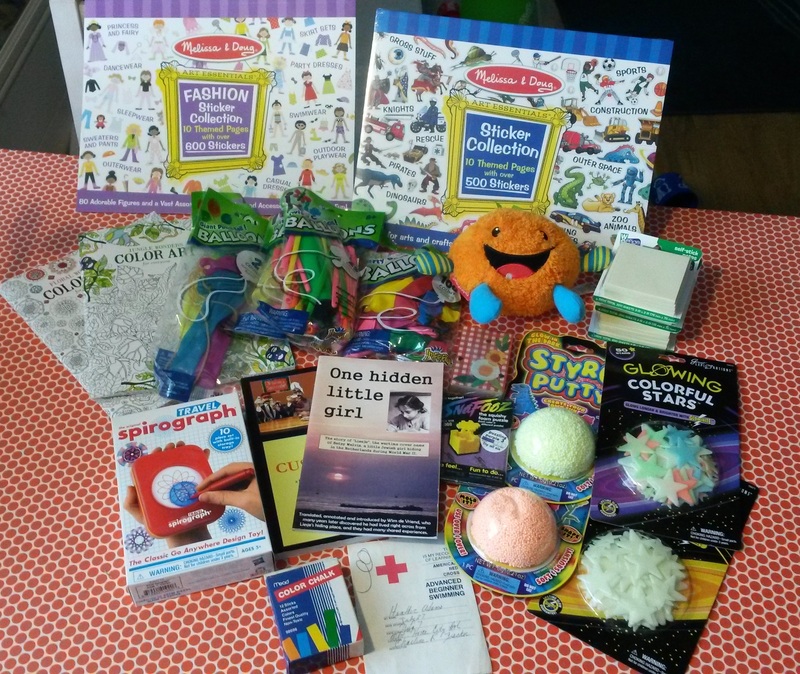 And this is all the stuff that was inside of it. Plus a Chutes and Ladders game that isn’t shown. We have enough balloons to last us a lifetime. My lovely friends gave me these beautiful flowers. 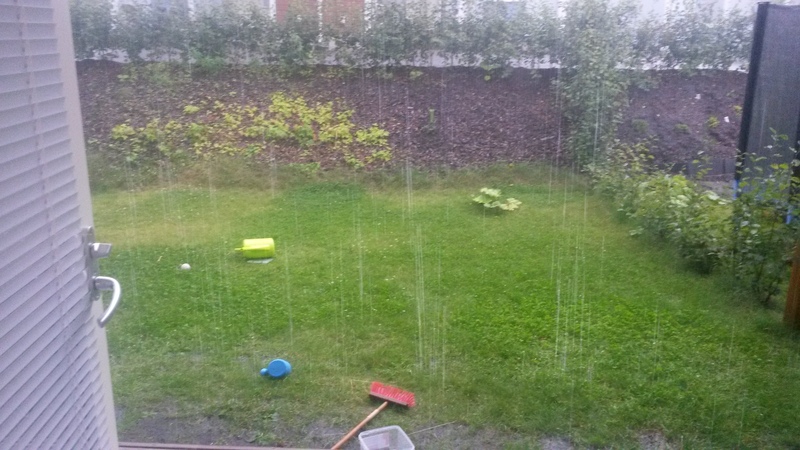 The end of summer, for us and well, mostly all of Finland, wouldn’t be complete without a “bit” of rain. Paxlet thoroughly enjoyed playing in the downpour. Tomorrow is my first day back at work since the end of February 2015. That’s 1 year and 5 months away from work. Not long enough! I feel like my grumblings about having/getting to go back to work sound ungrateful. Especially when I am constantly aware of how short the time is in the US. I also know some people don’t have a job to go back to. I am so incredibly thankful for the time I have had to be home with my kids. Updated with pictures at the bottom. It was (still is for another hour) my birthday today. Mostly, it was a day like any other day: taking care of kids, food shopping, cooking, cleaning and eventually getting the kids to bed. Aaah! Silence. Evening silence is always nice. I received the best gifts this year. Mr Siili bought me a new-to-me laptop. It was a complete surprise. I was happily plugging along with my very slow laptop. This former business-owned laptop is insanely fast! 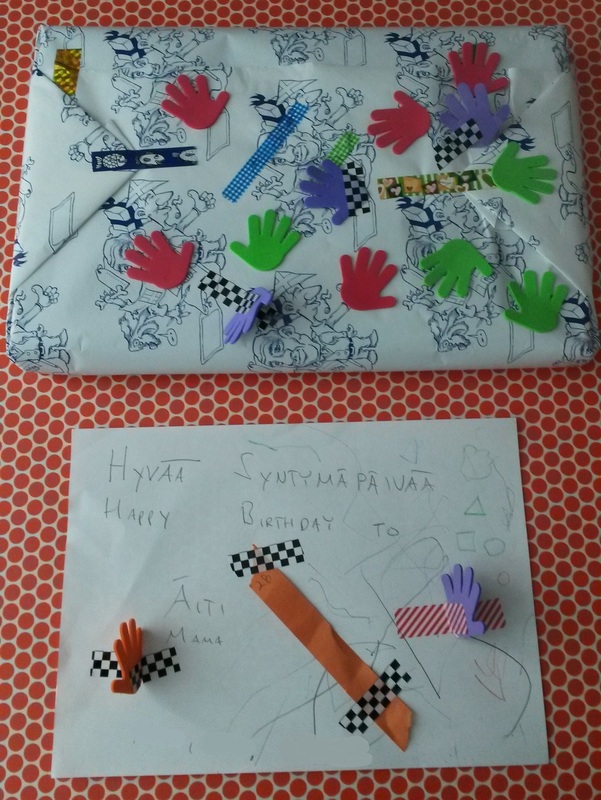 I got to test it out the last couple of nights, but Mr Siili and the kids wrapped it up this morning and made me a card to go with it. 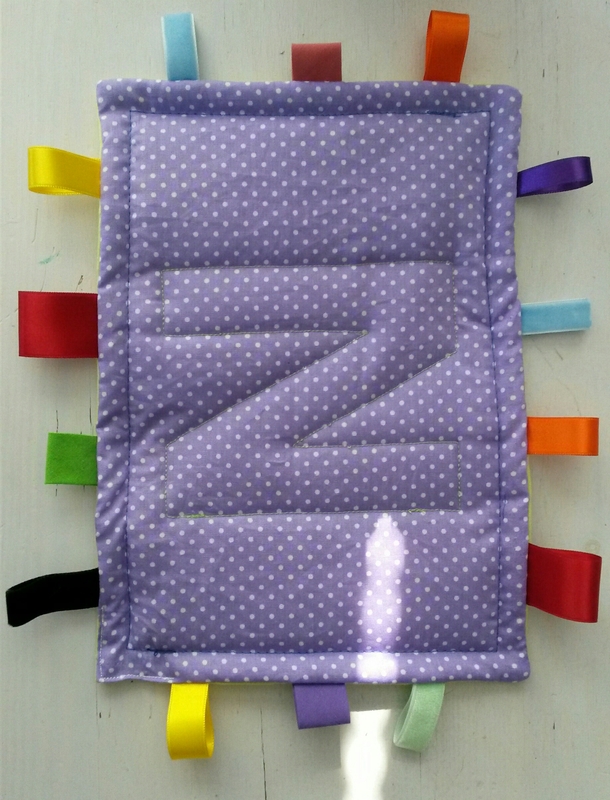 Paxlet covered it with stickers and wrote his own name. Tadbit even drew on it a bit. Also, I received a package from my family last night. 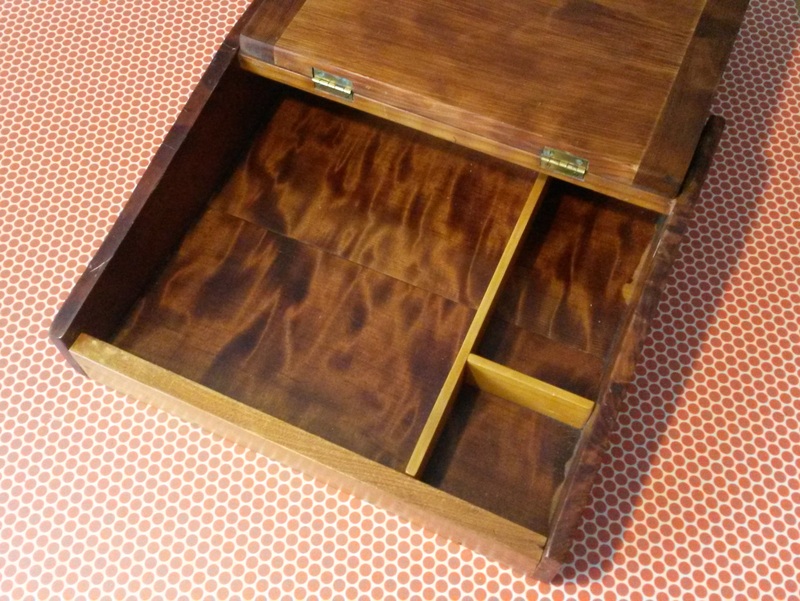 In the package was the redwood desk my dad made me when I was a little girl. Oh my goodness! I love it and am so happy to have it here. I’ll take pictures of it and post them soon. During this evening’s peaceful silence, I’m baking a Chewy Gooey Brownie Cake for my “party” on Saturday. 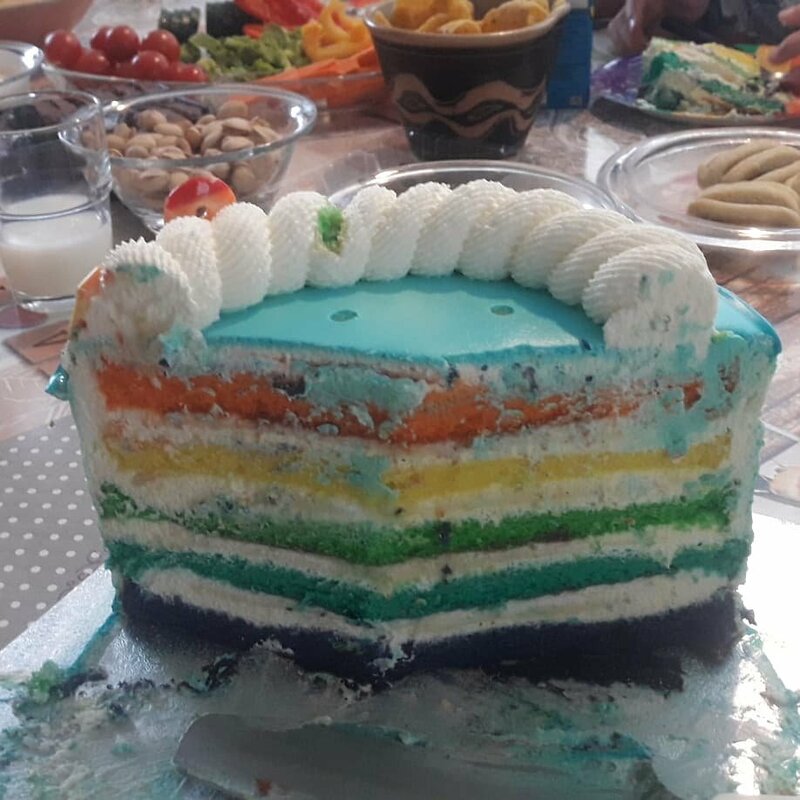 This cake, if you can really call it a cake, is everything the title says and more. It is a dense, chocolatey, gooey heaven with a cream cheese like layer on top. I remember when I first tasted this at GCC, the coffee house where I worked at when I was younger. I didn’t try it for a long time because there is nuts in it. I don’t do nuts. Not in my Banana Nut Bread nor my Chocolate Chip Cookies. But this, it works! And nuts aren’t so bad in the other two recipes either, just if I have the choice when baking them, I leave the nuts out. Here’s the crust (right) and filling already prepared and the spring form pan waiting to be assembled. I have taken to doubling the topping (filling) because it is yummy! And in my opinion, there’s not enough of it as the recipe calls for. Here you can see some of the crust drowning peeking out from under the topping. 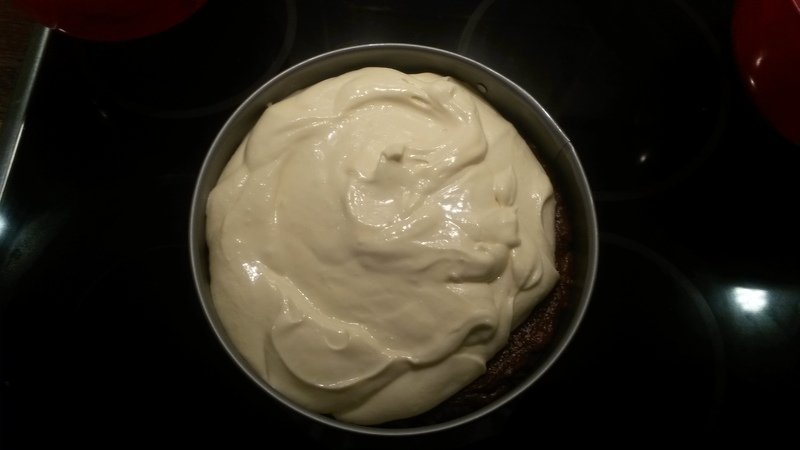 When a regular amount of the topping is made, you want to spread the topping close to the edge, but not quite going over it or touching the sides. Once baked and cooled, it creates a pretty edge/rim. The cake is still in the oven. I hope to post finished pictures soon/tomorrow. In the meantime, here’s the recipe below. Use a toothpick to check for done-ness. The toothpick will come out clean when done. Use a 9″ spring form pan. Put a layer of baking paper on the bottom of the pan. 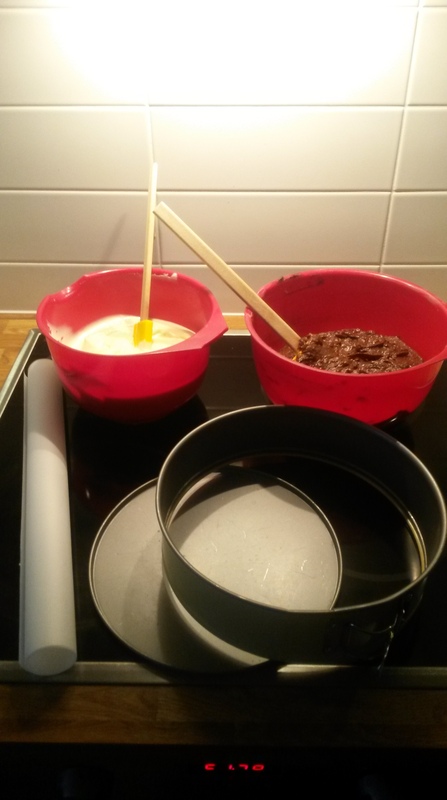 Cool the cake when done. Remember to remove the wax paper before putting it in the fridge to chill. 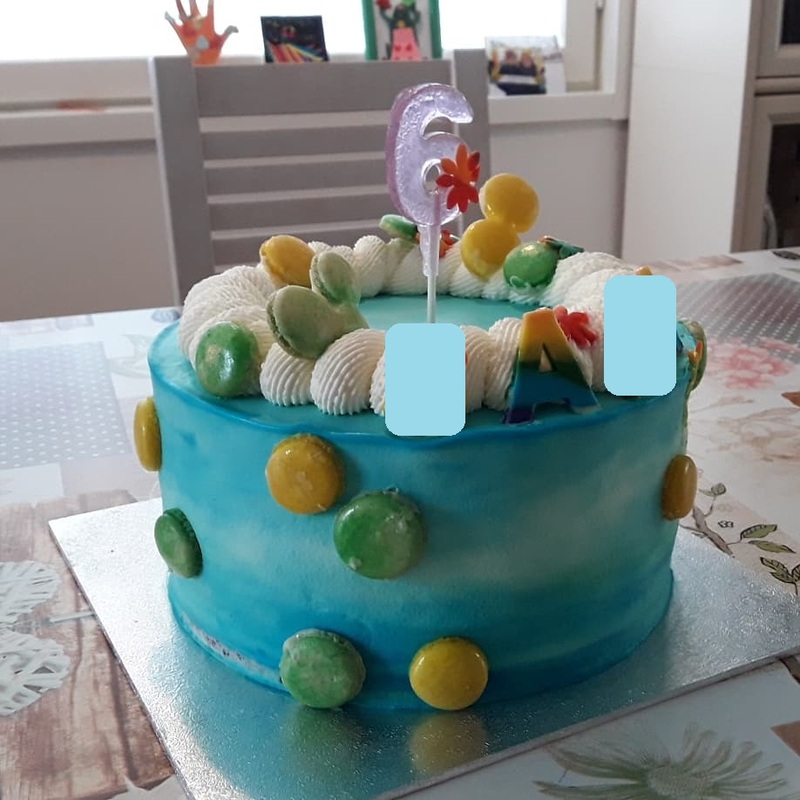 Update: here’s the finished cake on the left. My little girl is one year old!! I’m in disbelief, awe and love. Where to begin? I never expected a second child. I had hoped for a sibling for Paxlet, but I didn’t believe our one frozen embryo would amount to anything (it didn’t, in the end we donated it to science) nor that my body would spontaneously do what it was supposed to on its own. I’m still surprised that my body decided to get pregnant “like that”. I’m also proof that it only takes once to get pregnant. I just can’t believe I have what I’ve wanted for so long. I’m truly lucky. Tadbit is growing into a little person. She’s quickly developing a personality all her own and whoa is it going to be a big one. But what would you expect when she has me for a momma? – She doesn’t like to be told “no” (who does?). She gets the biggest pouty-quivery lip when I tell her no and she doesn’t like it. For now, it is insanely cute. Ask me about it again in a few years or when she’s a teen. – She’s had 6 teeth (two on the bottom and 4 on the top) for a couple of months now. Thankfully not much biting, yet. And no drooling! – Tadbit has been walking for a bit over a month now. She’s even started running a bit! That could explain why she doesn’t talk yet. Her brain and body have been working hard on getting her up and going, so she can keep up with her brother. – She does babble up a storm. Again, she has me for a momma. She does “caw” at crows, or any bird really. – Speaking of crows, she loves animals. Our cat wouldn’t mind being loved a bit less, but that’s what a grumpy 16 year old cat is like. She can spot a dog half a block away. And when we went to see Pappa’s horses, Tadbit eagerly had her hand out to touch the horse. She even got to sit on one of the horses! No fear from her. – Tadbit is a hugger. I just love all the times she will lay her head on me. I’m soaking them up, because I know they won’t last forever. (It’s definitely harder to get hugs from Paxlet these days.) On the other hand, she has started to throw tantrums. Don’t want to lay on the changing table? She screams and tries to roll away. Don’t want to put outside clothes and shoes on? She can arch her back with the best of them. Momma is too slow when feeding her food? She screams the house down! – This little girl of ours just adores her bigger brother. She copies him, in good and bad, emulates him the best she can and really just wants to be around him. When Paxlet is at daycare, she will push his cars around like she sees him doing. Paxlet, being bigger, has a decent collection of choking hazard toys. We’ve put them in a little carrying case that Tadbit can’t open yet. But she wants to play with those toys so badly! So, we’ve started letting her play with them as long as Mr Siili or I am sitting there with her. She is in heaven! She’ll go find the “treasure chest”, bring it to one of us and plop her bum on the ground with a big grin on her face, waiting for us to open it up. How can you say no to that? I love my little girl! This year has gone by fast and I know future years will be that same. But I can’t wait to see how this little girl will grow, change and become her own person. At the same time, it will continue to be amazing to see how much a like and yet different she and her brother are. They might share the same genes, but they are definitely their own person. I love them both and can’t imagine my life without either of them. I count my lucky stars every day. My baby girl turns one year old tomorrow. I don’t know where the time has gone. I know that is as old as time and as cliche as can be, but I have found that when kids are involved, it is true. Time just flies! She’s definitely not a baby anymore, but she will always be my baby. I remembered and forgot about #MM last week. I dislike it when I do that. Mr Siili had his birthday a week ago Sunday. He’s old. Well, at least older than me (by two years). Paxlet turned 3 yesterday! My goodness time flies. He had friends over on Saturday and family yesterday. 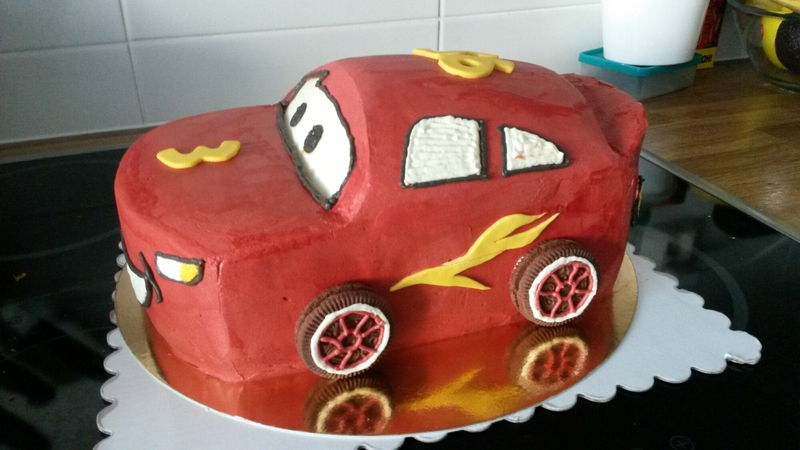 A friend made his cake. I’m totally impressed. I think Paxlet was too. 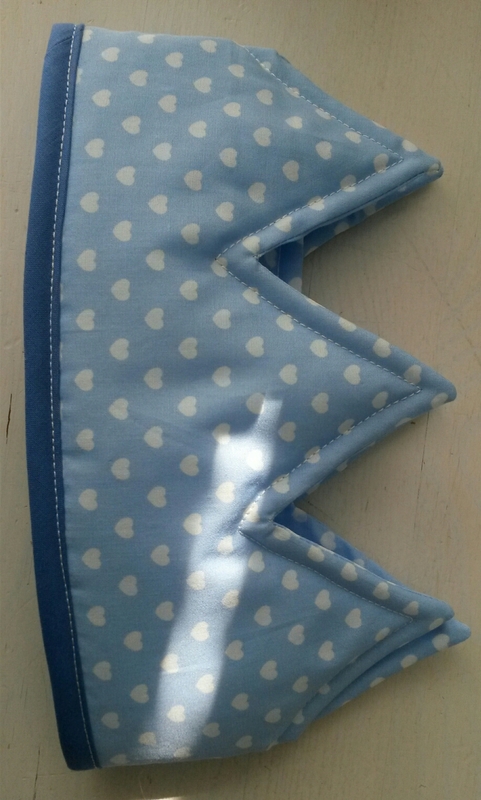 I’ve recently sewn two crowns. They are quick and easy (enough). I am going to try to get two more done this week: one for a friend’s birthday and the other for a friend’s daughter’s first birthday. I also made this for Tadbit. My hair has lost most of its midnight blue colour. There are several factors at play why it didn’t stay put so well. 1. I didn’t bleach my hair first. 2. My hair is too healthy. 3. The dye was over 10 years old. I’m telling myself that if i can find more hair dye locally, that I’ll bleach my hair and dye it again, properly. Paxlet starts Temppukoulu (trick/stunt courses/classes) tomorrow. I hope he likes it. Tadbit and I start Mummy&Me exercise classes on Thursday. I hope it helps my back and neck, which is what the class focuses on. I went to the chiropractor today. Parts of my spine feel great other parts hurt worse. But I know it will be better in another day or so. Also see above. This Thursday evening is a girl’s night out! I’m very much looking forward to seeing my girl friends. Tadbit will be joining us, as I don’t think Mr Siili would be up to the task of getting two kids to bed on his own. Especially after last night when we/I learned that Tadbit loudly and vehemently refused a bottle. Of my own breast milk no less! And how could I almost forget last Friday’s crisis. I locked my keys and wallet in my car, at the store. I just so happened to put my phone in my pants pocket while in the store. I rarely do that. I called Mr Siili and he picked up Paxlet from daycare. My friend J used our spare house key to find my spare car key (thankfully it was where I remembered it) and brought it to me. Sometimes it’s not all the friends you have, but the one that is there for you. I am so thankful for my friend.